We look forward to hearing/seeing how the kits work out for you. Watching mycelia grow out on agar can be a past-time in and of itself. Now you'll be able to isolate strong strains, do wedge innoculations and even keep backups of your favs. PM egghead with shipping instrux for the agar kits. I'd like to get them out on Tuesday, so send the info. Contest Update!! Ralphster, the sporeman from the Free Spore Ring, has arranged for each winner to also receive two free spore prints. So PM Ralphster44 with your shipping details and species/strain preferences. Thanks FSR!!! For those that didn't win, there will be two identical kits available in the Shroomer Fundraiser Auction. Each item in the kit came from a seperate purchase, so you'll save a lot of leg/mouse work by bidding on one of these. Thanks to everyone that entered. I'm glad to see so much interest. May the mush be with you always. congrats to the winners...egghead, does the little alien man come with the kit? hell, that would make it an "added bonus". sonofabitch.. i really wanted one of those.. why dont i ever win anything!?!?! it was rigged!!! rigged i tell ya!!! Yea, I'll send you an alien if I can catch one. I've tried spraying, using cintronalien candles.. I just can't get rid of 'em. They must be attracked to the mush..
Those are nice kits, I was really hoping to win one too. But I too won a free trop print from ralph. Which did make my day, I may buy one of those kits, I really want to try my hand at agar. I win ! I win ! .. right....? Congrats to those that won. This really was a great contest that I would have really loved to win. Doesnt matter anyway because I will get one in the auction, or at least jack up the price so whoever gets it will have to pay a hell of a lot more, muahahahaha :). egghead this contest was really cool, even though I didn't win. I thing the shroomery needs more contests like this so that shroom knowledge can be furthered in all of us. I still have not heard from any winners. 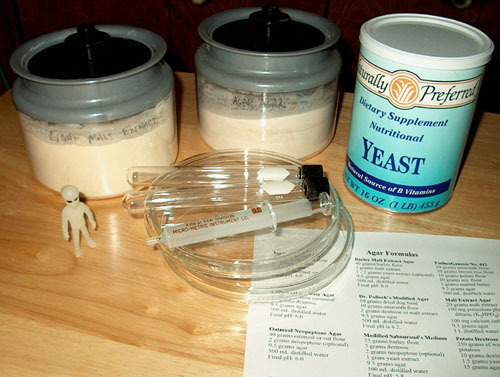 PM 'egghead' the shipping instrux for you agar kit by Sunday, June 3 @ 5pm. Or the kit will be given to someone else in the contest. If you've decided that you don't want the kit, that's cool too. Just PM egghead and let him know. 1,353 topic views. 28 members, 114 guests and 7 web crawlers are browsing this forum.